"One disadvantage under which Detroit is working is the extremely mixed character of its building – fifty thousand dollar houses, warehouses, saloons, institutions, slums, factories of all sorts, inexpensive dwellings, great apartment houses, and huge billboards follow one another almost in the same block, to the great detriment of practically all classes of occupancy. A zone system, if established, would bring order out of this chaos; and it would so stabilize the character of neighborhoods as to greatly increase land values. Though such control may at present be impossible, much may be done to assist in establishing zones or districts confined to one type of use, such as residential, industrial, and the like." This suggests that the ‘Smart Growth’ goals of mixed uses and mixed incomes may not be so ‘smart’. Of course, those who believe in intermixing all sorts of uses and incomes on the same block refer to cities where, a century ago, such a mix was normal, and suggest that the isolation of modern transitional zoning is a far worse option. "In this report, stress will be laid on the less expensive residential development, for which… if the street and lot system is not well adapted to it, there will result serious and at the time wholly unnecessary waste and expense. Moreover, the added cost in land and improvements is apt to cause a deduction in the cost of the building which will lower the standard of living in an entire district." The house should normally represent three fourths of the cost; the improvements, such as sewers, sidewalks, etc. about an eighth; and the raw land an eighth. Why is this so critical? Before the current housing market crash and the resulting depletion of American bank accounts, home builders traditionally stood by this model. But after the dot-com bubble, where investors put their money into vapor-ware only to see their investments disappear, the new favorite investment became land and buildings. In many areas of the country developers and national home builders went on a bidding spree, hiking raw land prices into the stratosphere. In the past, the financial rule was that a completed lot could not exceed 1/4th the total home price. The 'rule' was now broken, ignored or modified. Financial institutions also turned their heads away. Had the real estate market continued to hold fast to the above formula that served history so well, there may not have been a housing crash. "No Alleys. Alleys are unnecessary and wasteful of room, except where dwellings are in continuous rows or in groups of three or more. For detached and semi-detached cottages the space between adjacent houses necessary for light and air is sufficient also for a walk from the street to the back door." While alleys are fodder for heated discussions from many sides of the planning field, clearly this city's planners do not like them, yet this particular city is full of alley-laden blocks. Those that blame poor planning on the automobile embrace alleys as a way to hide cars in the rear yards. What this actually does is literally surround the home with pavement and vehicle use-areas. Instead of reducing the connection between home and automobile, it increases the connection. The authors clearly recognize this, and go on to promote common gardens and play areas in the rear yards instead. The report is very specific about street design. It suggests that the streets be sized for the traffic count, rather than creating unnecessarily wide streets everywhere, perhaps recognizing that too many cities have one size that is supposed to fit all. Unfortunately, planning and engineering consultants often seem to feel, inexplicably, that a short cul-de-sac in a city serving 10 lots somehow carries the same traffic as a street with ten times or more that number of homes. Many sections of Las Vegas, for example, from the air look like a sea of paving and rooftop – and that’s in the suburbs! "In rough topography the rectangular and the formal have no place, as they require heavy construction expense otherwise unnecessary. Even in flat country… the depressingly monotonous effect of the rectangular system should be avoided, on economic grounds if no other, for the dead level of mediocrity to which it brings districts depreciates their total value very materially. While to be sure no site is worth very much less than the average, none is worth very much more, whereas with variety in the layout many lots may be created with unusual value, due to location, attractive outlook, and special shape of lot adapted to the needs of the particular resident." Oh my, such harsh words against the very grid pattern that the ‘Smart Growth’ movement promotes. It seems that the authors are suggesting a much more organic design, which can eliminate the monotony that detracts from housing and community values. It would seem that the very rigid relationships that are being promoted by ‘smart code’ proponents would not be embraced in this city, at least not by the top level staff and advisors. The details of this report? It was located in the Cornell University Archives library annex. Called Detroit Suburban Planning, and authored by Arthur Coleman Comey, Landscape Architect, it was based on the preliminary plan for Detroit by Edward H. Bennett, Architect. It included input from the commissioner of parks and boulevards, the commissioner of public works, and the city engineer. 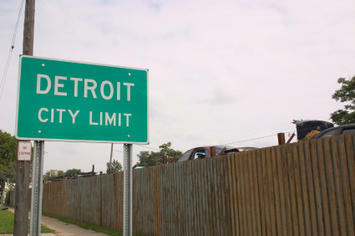 I grew up just outside the border of Detroit in the 1950s and early 1960s. It seemed that, for the most part, development continued on the same grid patterns, ignoring this report for at least the 40 years that followed its publication. Today, to provide a hope for sustainability for Detroit, we need to heed the report and provide better housing for those that cannot live in architectural wonderlands that only the wealthy can afford, or be subsidized by tax dollars that are no longer available. The development process of trying to jam each and every unit allowed by a regulation's most minimal dimension in order to achieve the highest possible density pretty much guarantees that the development will fall into the very same traps that the report warned us about. Rick Harrison is President of Rick Harrison Site Design Studio and Neighborhood Innovations, LLC. He is author of Prefurbia: Reinventing The Suburbs From Disdainable To Sustainable and creator of Performance Planning System. His websites are rhsdplanning.com and performanceplanningsystem.com. To learn more about the kind of communities described in the report, check out Harvard University's Graduate School of Design's Landscape Urbanism writings and programs, or, to learn more about Prefurbia as applied specifically to this kind of redevelopment, click http://www.rhsdplanning.com/redev.swf (to request a DVD, contact rharrson@rhsdplanning.com. Submitted by Rick Harrison on Mon, 06/20/2011 - 09:11. On page 22 it shows three award winning layouts done by other planners over a century ago, with an explanation (on page 25) about a Chicago design competition held in 1913 for which the layouts are based upon. The 1st place prize (the irregular plan) ‘has brought to its highest development in German cities’, keeping in mind this is before World War One. It suggests that this form of planning coordinate the building and site design at the initial stage, something that even today, is rarely accomplished. The 2nd place goes to the curvilinear design, which for the most part was not all that ‘curved’, still having most of its streets emulating somewhat of a grid pattern. The only negative comment was that it would be difficult to mesh with a conventional grid that Detroit was based upon. The 3rd place plan was a more linear (straight street) formal layout that did not follow a traditional grid pattern. It did mention that a certain amount of ‘curving streets’, where they fit in ‘readily should provide an effective ground plan’. So the question remains, if these three alternatives were superior to the grid (shown on the lower right corner of the above plan), why didn’t developers embrace the new planning styles, at least within the confines of Detroit? 1)	The 1st and 2nd place designs were too advanced for the engineers and surveyors of the day. A straight street took very little time to calculate and set lot corners. The tedious mathematics of a lot corner intersecting a curved street added ½ hour in the office, and even longer in the field, for street and utility stakeout. It was not until 70 years after the document that widely available computerized automation allowed quickly calculated curved plats and survey total stations that could field stake curved streets in a timely manner. 2)	When looking through old plats records it seemed developers bought just a few blocks at a time. One blocked may be called ‘Smith Addition’, and a series of a few adjacent blocks called ‘Jones Addition’. It appears as if that developers of yesterday were likely home builders that would build a block or two at a time. What the contest demonstrated was large developed areas which may have been unusual for the day requiring more of a modern developer who takes on acreage at larger scales of more ‘master planned communities’. The plan on page 22 also indicates why the grid plan was not as efficient. The vertical streets have homes that front along them, being 100% efficient. However, the horizontal streets are used to provide vehicle and pedestrian connectivity only, but have no home frontage, being 100% waste. There are 7 vertical streets and 3 horizontal streets, or an efficiency of only 58%! Of course this was in 1915 where traffic was low . Today’s city and county engineers would not allow homes fronting arterial streets, nor would they approve multiple intersections because of the increased traffic loads. The award winning plans are more efficient than the grid, but not significantly better. Unfortunately bland development patterns were not just a problem of 1915, but perhaps even a worse problem today. Our current housing market has thrown this country into a deep recession, yet banks that have repossessed monotonous cookie-cutter development have done nothing to redesign them into exciting sustainable and more valuable properties. Developers are buying these projects at repossession pricing only to build and sell homes in unsustainable neighborhoods at very low (unprofitable?) pricing. We are at a critical crossroads in this country, and President Obama is correct in his statement that American Innovation will pull us through. We have the ability to build outstanding sustainable communities, right now, today. Today it is possible to design developments with perhaps 20 to 30 percent more efficiency than the award winning layouts of 1915, and about 50% more efficient than the conventional grid. We can build homes where living spaces blend into surrounding neighborhood open spaces. These open spaces would contain a comprehensive connected and safe pedestrian system. We CAN develop land with less environmental impacts and with significantly less development cost with much greater efficiencies than ever before. All of this translates into providing a better product allowing builders to sell higher quality and higher value home that use less energy at reasonable prices. The environmental and economic advantages are huge, but it requires effort of the entire land development industry to harness more advanced technology and take the short time to be educated to harness the latest methods of design. What better time to retool and re-educate, but in a recession when so many have idle time?